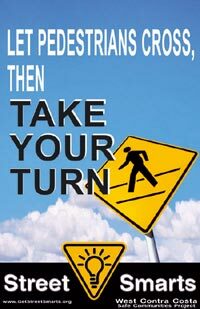 In October 2002 the Contra Costa Safe Communities Project (WCCSC) recommended "a regional traffic safety education campaign to include a variety of traffic safety messages aimed at motorists, pedestrians, and bicyclists." 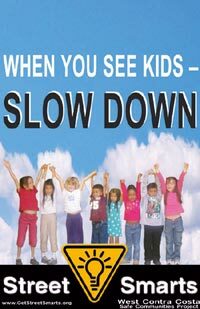 The Contra Costa Street Smarts Campaign kicked-off at a media event in April 2004 and is currently rolling out campaign activities in schools and community settings. Five colorful slogans are being displayed on the sides of bus stops, at festivals and events, in newsletter inserts, on cable television ads, on bumper stickers on city, county, and school district vehicles, and on posters in local businesses and schools. Incentive items that carry the Street Smarts message are being given away at local events to remind people to drive, walk, and cycle safely. These web pages are part of the Injury Prevention Project web pages, under The Community Wellness & Prevention Program of Contra Costa County Health Services. For more information, call 925-313-6837.